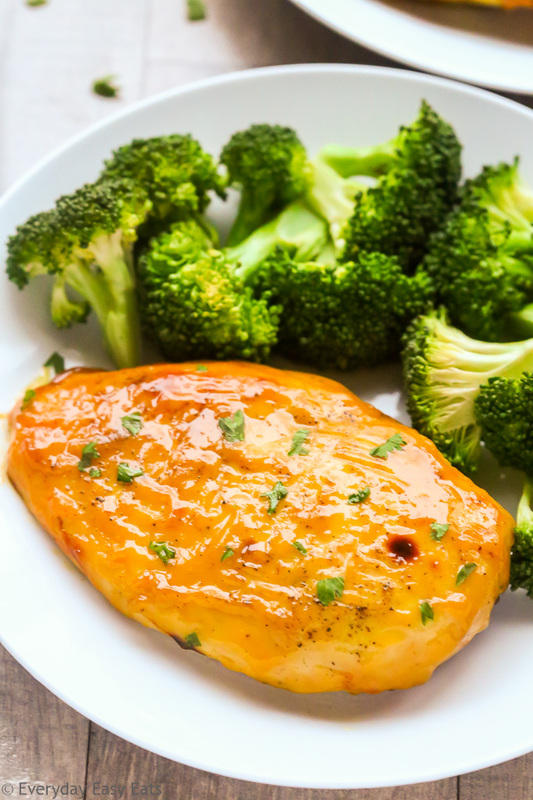 This easy Baked Honey Mustard Chicken Breasts recipe makes a flavorful, healthy chicken dinner that is perfect for busy weeknights and meal prep. It pairs perfectly with steamed vegetables, pasta or rice to make a satisfying meal that the whole family will love! You are going to want to add this Baked Honey Mustard Chicken Breasts recipe to your regular dinner rotation. It requires only four ingredients to make (not including salt and pepper), which you probably already have on hand. This easy recipe is also super tasty and high in protein, but low in fat and calories. Is eating chicken breast good for weight loss? Chicken breast is a great animal protein to consume, because it is extra-lean. Without the skin, one serving of 100g of roasted chicken breast barely has 2g of fat, which is the equivalent of less than one teaspoon of butter. In comparison, the same quantity of extra-lean ground beef contains nearly 8g of fat. In addition to providing essential vitamins and minerals, chicken breast is high in protein (33g for 100g of chicken breast) and contains a high amount of amino acids. The dark meat in chicken (such as the legs) is twice as rich in iron as the white meat (the breasts). However, if you’re watching the amount of fat in your food, white meat is a better option, because it contains less fat and more protein. Make the Sauce: Combine the honey, mustard and olive oil in a bowl. Taste, and then season with salt and pepper to your liking. Add the Chicken: Coat the chicken with the honey mustard sauce and then place it in a baking dish. If you have time, you can leave the chicken to marinate in the sauce for 30 minutes or longer. Bake: Place the dish in the oven and cook the chicken for 20 minutes, then turn the chicken over, and bake for another 20 minutes or until fully cooked. How do you know when chicken breast is fully cooked? You can check to see if your chicken breast is done by slicing it open with a knife. If the meat is white in the center (ie. no longer pink) and the juices run clear, the chicken breast is cooked through. If you want to be sure, you can use an instant read meat thermometer. The chicken can be safely eaten when it reaches an internal temperature of 165ºF. ThermoPro Meat Thermometer: An instant read thermometer is a great kitchen tool to have, because it takes all the guesswork out of knowing when your meat is done. This one is quick and easy to use, and it’s more affordable than many others out on the market. You can learn more about ThermoPro here. 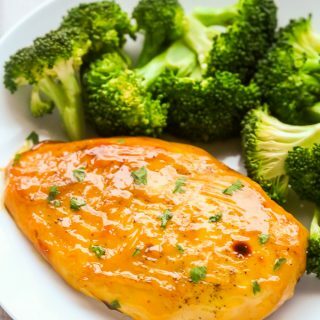 This Baked Honey Mustard Chicken Breasts recipe makes a simple, healthy chicken dinner that is perfect for busy weeknights and meal prep. In a mixing bowl, whisk together the honey, mustard and olive oil. Season with salt and pepper to taste. Add chicken to the sauce and toss to coat. Arrange the chicken in a greased baking dish and pour the remaining sauce over the chicken. Bake for 40 minutes or until the chicken is golden and cooked through, flipping over halfway through cooking time. Serve immediately or store in the refrigerator in an airtight container for up to 3 days. The chicken is done when it is no longer be pink in the center and it reaches an internal temperature of 165ºF. For a full meal, serve the chicken with steamed vegetables, cooked rice or pasta. This chicken recipe is so easy and tasty!! I marinated the chicken in the sauce overnight and then made it for meal prep and it was so good! Thank you for sharing!